(1 ea.) is designed to Wall Mount ROHN H50, H40, H30, H20 Channel Master 1620, 1630, 1640, 1650, 1820, 1830, 1840, 1850 Telescopic Push-Up Antenna Masts. 14 gauge steel with set screw, adjustable for Clamping Antenna Masts from 1.25 to 2.75 inches in Diameter. 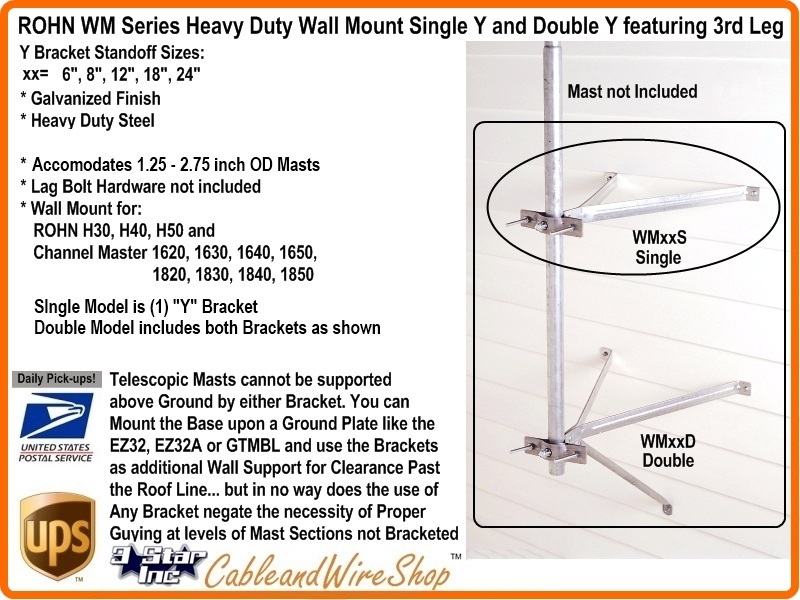 This Bracket will Stand off any Antenna Mast within this Diameter range, but is not designed to support the weight of any Telescopic Antenna Mast off of the Ground. Bonding should be made by affixment to Mast. Consult NEC and Applicable Local Code for further guidance. Note: A very robust wall mount bracket specifically designed by ROHN to use with their H-Series Telescopic Masts. Made in the USA and Proudly offered by us, to you!